Apart from a surfeit of nail bars and chicken shops, the cheaper parts of south and east London still have a range of specialist shops. 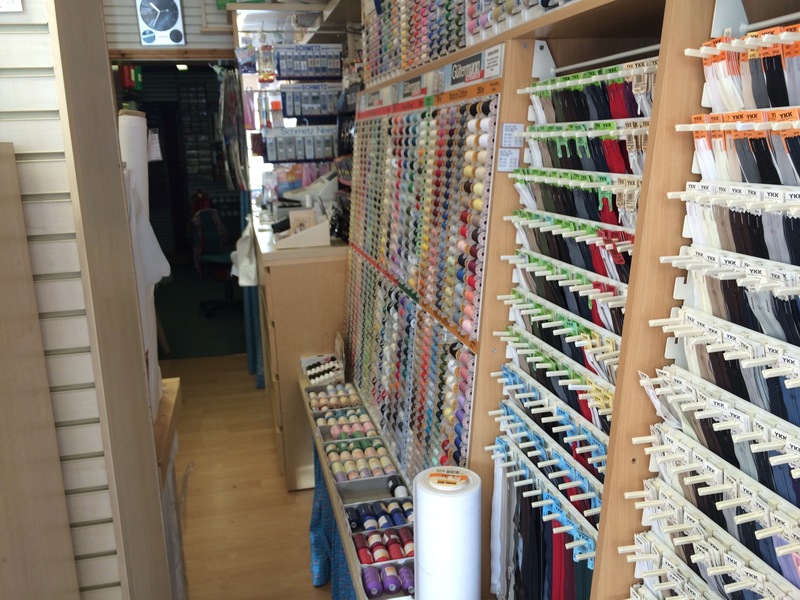 World of Sewing is located in an unpleasant part of Croydon, on the road to Brighton. Of course there is a demand for haberdashery, fabrics and sewing machines shops, but the price of real estate in Central London, plus the internet, has reduced supply. My foray into a few of the warehouse shops of the North of England showed me that the internet is dominant, except where land prices remain distressed. 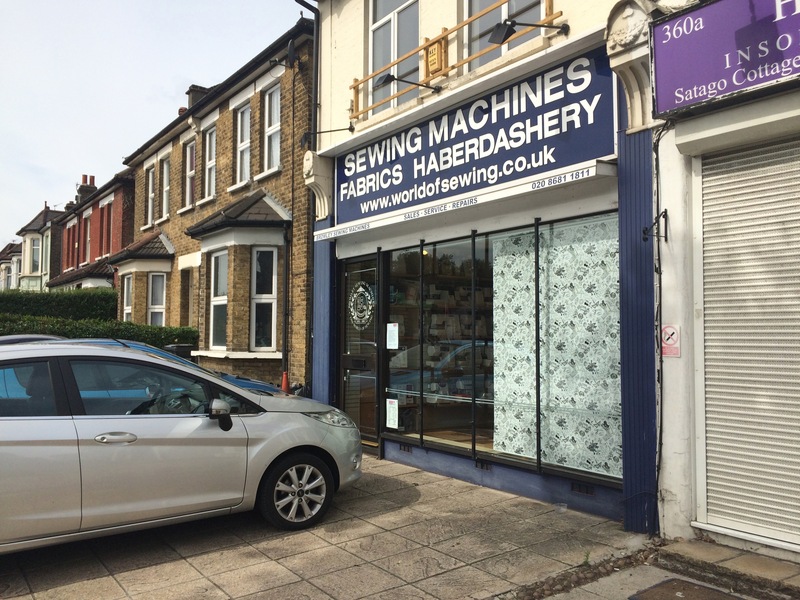 World of Sewing does have a website, proudly proclaimed on the front of the shop, but I wouldn’t buy a machine online without trying it first. Having researched details of specific models, the prices at World of Sewing seemed keen. Park outside (it is not really accessible by public transport), go in, and you will find a small but very well stocked shop. Local people come here for their quilting supplies, thread, a pressing aid, or some needles. The manager is Jennie – a grey haired lady who knows her stuff and is dressed in a smart white blouse, navy skirt and smart flat shoes (every day). A shopper comes in “Oh so glad you are still here (Jennie, or the shop?). I want some black bias binding”. Another person arrives with a broken zip; “Do you do alterations?” “No, you can try the drycleaners”. “Well what about a 20″ white separating zip?” “Yes we will have some next week – come back then”. I think, but of course I don’t say it out loud, “what is wrong with the internet for a zip“? But maybe if you only want one, and it is not urgent, maybe it is nicer to talk through how to insert it with Jennie rather than just go for it, on your own. Although I wouldn’t bother with it for a zip, it is certainly somewhere to consider if you wish to buy a sewing machine. In fact liked it so much I bought two! One a year ago I bought an overlocker. And then, after a long period of research, pondering, test drives and longing, I bought another one. I have explained my thought process on what machines I might buy. So I more or less made the decision, and then visited World of Sewing. I had to wait for ten minutes while the customer before me chose some patchwork supplies, but once free Jennie was the most professional salesperson imaginable (and unwilling to be photographed), with her clear tights, low court shoes and thick, tidy hair. She is helpful but clearly an introvert. You have to ask for information, and then you get it. So I spent a happy half hour putting the Juki through its repertoire. Advised by Mrs Mole I checked it could handle chiffon and denim. I tried blind hemming and button holes, decorative stitches, using the knee lift. Eventually I was satisfied that the Juki was just what I had always wanted and I got my husband to put the machine carefully into the car. Jennie assured me I could call at any time if there was something I needed to know. Once home I found I had been given a good induction and the instruction booklet plus a DVD are available for more challenging topics. I have also had what is now my “spare” machine serviced here and I would recommend it. Some commentators feel being asked for £25 up front for an estimate is a bit rich. And some people argue about the cost of a service (around £100). But I feel that they did a very good job and if you use your machine daily then this is a reasonable investment to make. The labour, workshop and careful customer service mean you can’t get a good service for much less – in my view (but happy to be corrected). Overall I would give this company 8/10. They have other shops in Tunbridge Wells and Pratts Bottom (yes, really). Thank you so much for this info. My local repair man who had a big shop on Shepherds Bush Green has closed down and I wondered what I was going to do if my little Bernina developed a problem. I remember when these sort of shops were dotted all around London but now the are few and far between. My believed Janome makes a squeaking noise at high speeds but I don’t have a backup anymore. I need to find somewhere to get it serviced. For north Londoners Chapman’s at Camden Town are still flourishing and giving excellent service (http://chapmansewingmachines.yolasite.com/). They gave my 40-year old Frister & Rossmann a thorough repair and overhaul in June. It cost £70 with a 2-year guarantee and was well worth it. I’m so amazed and grateful that their shop is still there and hasn’t yet been turned into a hipster boutique or trendy cocktail bar. Thank so much for the information Maria Josephine! I agree it amazes and thrills me that some of these shops survive. What a great find for you, Kate. Having the time to test drive a new machine and introduced to its features by a fellow introvert is the key. Having a one-to-one discussion with someone who is not a high pressure salesperson makes the whole buying process a rewarding one. Finding a good service tech is a bonus. Servicing a machine at least every 2 years depending on the volume of sewing makes good sense. I don’t mind spending the money for a servicing as they can find small things that need adjusting and lubricating before it turns into a bad noise and ultimate costly repair. I used to drive 4 hours to a dealer and leave my machine for some TLC as they called it but now having a retired repair gentleman in my own town is a godsend. Enjoy getting used to your new “baby”! Enjoy your new machine – with the price of a good quality machine it’s essential to try before you buy. I’m very lucky in that through my local fabric store I found a repair / service guy – he works from home and does it as a 2nd job – so his prices are very very good – just had my over locker serviced and new upper blade for £40 all in! You’re in for a treat, it’s a delightful machine and a joy to use. Interesting to read of your buying experience I would’ve been disinclined to purchase from there in the same circumstance. Product knowledge isn’t much use if customers are put off by aloof staff, I doubt you got some added extras thrown in but I hope you did. A few bits, but nothing to make me go again! Lucky you, congratulations! I would like to get a new machine, as mine is definitely a bit touch and go (things tend to fall off, no matter how many times I adjust them, although maybe I’m just hard on my machine :)), but I don’t think I could even buy a good one like that here. PS I liked your description of the place. Often we find the best things in interesting places. How cities adjust to economic conditions is endlessly fascinating. My Juki overlocker has been used like a taxi for years. It really needs to be serviced but I don’t want to be without it. Horns of a dilemma there! Enjoy getting to know your new machine. I know what you mean. An overlocker, because it cuts too, seems to get much muckier than a regular machine. Not sure I know how to keep it clean.